Confidence Fitness Home Gym Multi Use Weight Lifting Bench with Butterfly Attachment V2 by Confidence at Strongman Pictures. Hurry! Limited time offer. Offer valid only while supplies last. From Confidence Fitness comes the multipurpose Home Gym, a weight bench featuring bench press station, fly station, and leg extension station. From Confidence Fitness comes the multipurpose Home Gym, a weight bench featuring bench press station, fly station, and leg extension station. Challenge your body with three highly effective workout approaches. Queuing for a weight bench in the gym is a standard obstacle to the bench press. However, the Home Gym will let you sculpt your chest and shoulders by performing exercises at multiple angles. Simply adjust the incline to vary the focus and intensity. Target the outer portion of your pecs by switching over to the fly station. 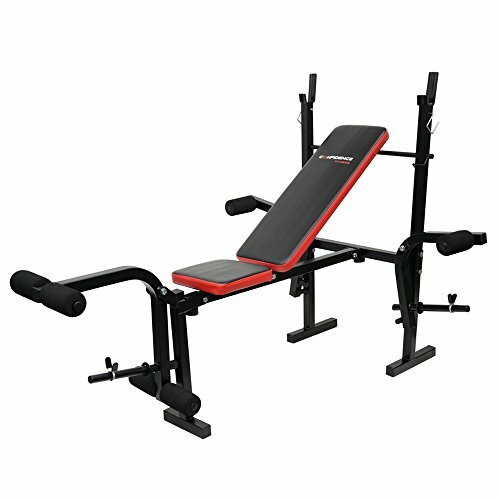 Each side is capable of holding 66lbs for pec deck reps.
Leg excuses no longer have to be made, as the bench features a leg extension station ready to build your quads, glutes, and hamstrings. A comfortable high-density seat and back pad offer needed support throughout your entire workout. All you need to focus on is completing your next rep.
A multi-use weight bench from Confidence Fitness will let you build and tone your chest, shoulders, and legs on your schedule. Fold the bench way for when you need to save space.